Need help overcoming outdoors stairs? Want to enjoy your outdoors spaces again without worry about falls? Call today to learn more about the Horizon Outdoor Stair Lift. This model has been especially designed for outdoor spaces and can withstand anything Mother Nature throws at it. All the electronic and mechanical components are protected, making it the ideal choice for any straight, outdoor staircase. This model comes standard with a variety of great features, including: a 300 pound weight capacity, a diagnostic digital display that is located right in the arm, a seat belt and a key switch for extra security. The easy to use joystick controls make this stair lift super easy to operate. 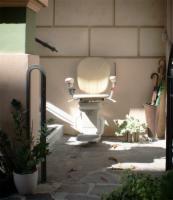 Get back to enjoying all areas of your home with the Horizon Outdoor Stair Lift.